Powered Air Purifying Respirator - for welding & particulate environments. The pro-line PAPR system supplies clean air reducing the effort required to breathe in fume environments. The electronic system for controlling the airflow monitors the blower in order to ensure a constant flow of min.170nI/min*. The operating time of the pro-line air unit with a fully charged battery depends on the & filter state but run time on the low setting is normally more than 11 hours & 9 hours on the high setting. Has enhanced warning signals, optical and audible alarms for low power, clogged filter and reduced airflow. 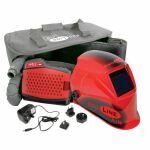 The welding helmet features a multi adjustable headband with enhanced supports to spread the load evenly on the wearers head, vibration warning for low air flow. The unit is fitted with a P3 Particulate main filter coupled with a carbon odour pre filter and a stainless steel spark trap to preserve the filters, all filters are replaceable. Filter lifetime is dependant upon the working environment. The unit is not suitable to operation in areas where the oxygen supply is depleted or there may be a risk of toxic gas build up.